Backed by the rich industry experience, we offer to our esteemed clients an extensive array of Doctors Stethoscope (Item Code: O.P.D-01). This is a diagnostic instruments used by doctors to ascertain vital signs of human body such as heart beat, pulse rate and nervous system. 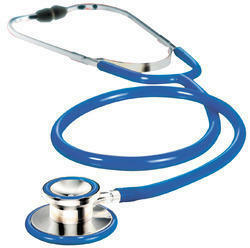 Our doctors stethoscope is known as high quality clinical instrument to determine the heart movement of the patients. It is configured with components like stainless steel/brass chest piece of diameter between 36 and 47 mm, extra deep conical bell for excellent low frequency response, inner spring Binaural and floating diaphragm for amplified voice & excellent mounded PVC Black tubing. With hi-tech infrastructure, we offer to our valued clients an extensive array of medical equipment like B. P. Apparatus mercury (item code: o. P. D-02). This is a medical instrument used to measure blood pressure of the individuals. 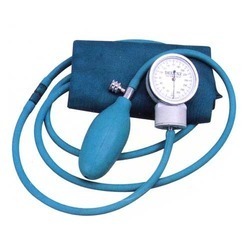 Scientifically known as sphygmomanometer, this instrument is manually operated by the expert person to measure systolic and diastolic pressure of the patients. this apparatus consists of an inflatable cuff to stop the flow of blood from certain body organ. All sphygmomanometers are used with supported devices like inflation valves and bulbs ( for manual instruments). 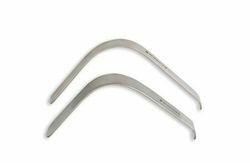 Available in three different sizes, the lack tongue depressor for children, adolescents and adults are available in 13mm wide , 19mm wide and 22mm wide respectively. 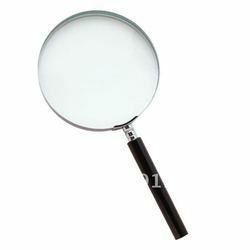 Magnifying lens best quality heavy and thick glass fitted with metal chrome plated frame, handle provided for the user. Blood pressure apparatus aneroid type gauge construction made of metal with high accuracy and the cuff made of best quality fabric, bladder and tubing set made of green rubber of best material, valve made of brass and with know to release and fix the air inside the bladder while use of the apparatus, bulb made of green rubber, unit comes in the pocket type carry case, easy to handle. Ambu bag made of silicone to rescue to patient in critical conditions, the ambu bag is available in three different sizes like Neonatal , peadatric, and Adult unit available with mask, and set of tubing. all set packed in a carry box to carry. Laryangoscope four Blade with Handle fiber optric light , the laryangoscope use for incubatation of the patient at the time of emergency when E.T. tube need to fit , four bale of diffrent size for diffrent age of patient, made of stainless steel with dull finish, battery operated dry cell two number in the handle presented in pouch pack, easy to clean and use. Scratch less, smooth and excellently suited to purpose. Top quality instruments yet economical. The choice of 'c' or 'd' handles. Supplied with one spare bulb of each instrument. Set of otoscope, throat illuminator, laryngeal mirror, nasal speculum, tongue depressor, +c handle in case set of otoscope, throat illuminator, laryngeal mirror, nasal speculum, tongue depressor +c handle in case reflex. which allow to keep the cuff and bulb of the B.P. 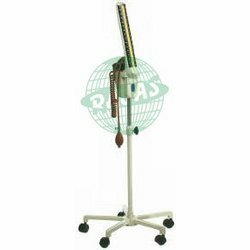 after examination, 5 spoke stand available with plastic wheel and stand made of poly proplene material. 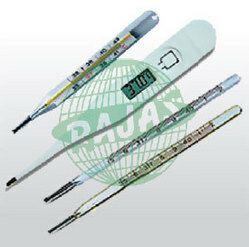 Light weight, accurate temperature measurement and manual operation.